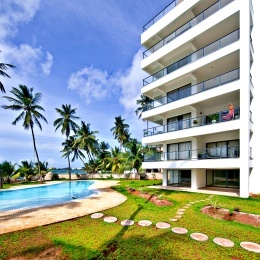 An indulgent getaway, Xanadu Luxury Apartments offer a 3 bedroom home along the sands of Mombasa's Bamburi beach. Securely located behind a perimeter wall, Xanadu offers direct access to the beach, ensuring fantastic views of the Indian ocean. These exquisite apartments will truly exceed your expectations so you can share special moments with your friends and loved ones during the vacation of a lifetime. Situated in an area of Kenya known for fun and relaxation, you will be perfectly poised for the ultimate holiday in the sun! Mombasa boasts a warm climate, vibrant nightlife scene and beautiful beaches. Just imagine lounging, looking into the distance as the fiery sun rises above the ocean waves that crash harmlessly onto the Mombasa coast. This coastal home constructed in modern chic fashion can house up to 6 guests who will be amazed by the finery within. Xanadu is comfort defined. Guests at Xanadu will marvel at what Mombasa's nature has in store for them. This oceanfront property is near coral reefs that are home to exotic fish and turtles. Mombasa may be a relatively small town, but it’s still has all the action with facilities including Haller Park, City Mall - Nyali, Nyali Golf &Country club, spas, restaurants and bars available. Have your vacation, your way with Xanadu!